A reference suitable for everyone; researchers, historians, organizations and individuals for activities that require the identification of corresponding dates in the past and/or in the future. People in the Arab peninsula generally followed the lunar cycle to keep track of months. This was done by observing the phases of the Moon. There was no unified starting year and no wide-spread scheme to maintain a calendar of these lunar months. The bases of the Hijri calendar were laid down during the ruling of Khalif Omar Ibn Al-Khattab 634-644 AD. The proposed calendar was based on three simple rules, which can be restated as follows. First; the starting year of the calendar is the year when the Prophet Mohammed migrated from Makkah to Madinah. This year corresponds to 622 AD. Second; One lunar year has twelve months starting with Muharram and ending with Zul-Hijjah. Third; the duration of each month is equal to the duration of one cycle of the Moon phases. It is to be noted that "migration" in Arabic is called Hijrah and hence the name Hijri calendar. Although the basic rules for the Hijri calendar are simple in nature, computing the calendar for future and past dates is a complex process. Astronomy is a discipline that studies the cosmos and heavenly bodies based on Mathematics. It is the perfect tool to address past and future date computation. But before these tools are put into action a few facts need to be pinpointed for each rule. Let us go through the rules backwards to address these facts. The third rule; "the duration of each month is equal to the duration of one cycle of the Moon phases". Scientifically, this is equivalent to one complete revolution of the Moon around the Earth rounded to the nearest day since we use days as the unit of count to compose a month. It is the duration between two consecutive conjunctions. In other words, conjunction is the indication of the ending of the current lunar month on the day of its occurrence and the next day is the first day of the next lunar month. Methods to compute conjunction are well established in Astronomy and are widely used in our daily activities such as land, maritime, aviation and space navigation systems to mention a few. These methods are quite accurate and with proper extensions these methods can be used to compute the location of the Moon for past and future times. For the second rule; "One lunar year has twelve months starting with Muharram and ending with Zul-Hijjah." The sequence of months in a Hijri calendar starts from Muharram, then goes through Safar, Rabee-Al-Awwal, Rabee-Al-Thani, Jumada-Al-Awwal, Jumada-Al-Thani, Rajab, Shabaan, Ramadan, Shawwal, Zul-Qadah and ends with Zul-Hijjah. Coming to the first rule, the first day of the first year needs to be identified as a reference point for the calendar. Few calendars such as Jewish, Chinese, Hindu and Julian calendars were available to address this issue. The Julian calendar was maintained fairly accurately throughout history and was also widely in use in those days. The most accepted weekday and date for First of Muharram of First Hijri, was obtained by comparing the dates from Julian calendar, which came out to be Thursday July 15, 622 AD. To pinpoint the date and weekday of First of Muharram of the First Hijri year, the last day of Zul-Hijjah was evaluated for the previous year, i.e. one year before the start of the First Hijri year by considering the conjunction method in Julian calendar. This gave Wednesday 30 Zul-Hijjah in the year before the First Hijri year corresponding to July 14, 622 AD. A partial solar eclipse took place at this day. This sets Muharram 1, 1H on Thursday July 15, 622 AD same as above. The occurrence of the partial solar eclipse also confirms that the next day, Thursday July 15th, must be the first day of the next lunar month as solar eclipse always occur on the last day of a month in a lunar calendar. Based on the above and using the International Date Line as the date reference, the Saudi Hijri Calendar, known as Taqweem Um-Al-Qura, was prepared and published in 1972. This calendar was based on astronomical conjunction. Calendars for subsequent years were prepared and published, using the same criteria, till 1999. Another Hijri/Gregorian comparative calendar for 100 Hijri years, known as the Taqeem Al-Muqarin, was prepared and published based on the same astronomicalconjunction principle. Both of these calendars were accepted as the official yearly and comparative calendars of Saudi Arabia respectively. The idea of publishing this book, containing comparative dates for 2000 Hijri years, was conceptualized to complete the work that was started in 1972 and to present a comprehensive astronomical conjunction based Civil Hijri calendar to be used as a reference by researchers, scholars, historians and the general public for day-to-day civil purposes. I am thankful to my son Dr. Adel Fadhl Ahmed, Department of Information and Computer Science, King Fahad University of Petroleum and Minerals, Dhahran, Saudi Arabia for his untiring efforts in preparing the computerized version, valuable suggestions and final pattern of this Civil Hijri Calendar. My thanks to Capt. Farhat Siddiqui of Merchant Navy in Jeddah, Director in Bakri Navigation Company, and Mr. Nizamuddin, Regional Manager of Rolls-Royce International Ltd. in Riyadh, for encouraging me to publish this calendar. I am also thankful to Mr. Abdul Lateef Uthman, Hardware Computer Engineer with Ajwa Group Jeddah and Mr. P.M. Sirajuddeen, Chief Organizer of Hijri Committee of India for their unfailing support during the preparation of this text, the Civil HijriCalendar. Finally I am thankful to Mr. Ali Manikfan, the Chief Advisor of Hijri Committee of India for his eforts in disseminating the knowledge about the conjunction-based Hijri calendar among communities and for promoting the conjunction-based Hijri calendar worldwide. His untiring efforts to get this Astronomical Hijri Calendar accepted by the whole Muslim community as a unified Civil Hijri Calendar are commendable. This acknowledgement will be incomplete without recalling the cherished memories of the positive working environment and opportunities offered to me in the country which has now become my home. The Kingdom of Saudi Arabia has enabled me to carry out extensive research in a highest professional setting, allowing my efforts to come into fruition in the form of this calendar. The patronage by the members of the Royal Family of Saudi Arabia, the esteemed house of Al Saud hasenabled me to pursue my scientific endeavors and realize my potential , allowing me to contribute inmy own small way. I would like to thank all the people in the countries of India, Pakistan, United Kingdom who have taught me so much and enriched my life and of whom I have fond memories. -Ex. Director General , Institute of Astronomical Researches, King Abdulaziz City for Science and Technology (KACST) - Riyadh, Saudi Arabia. The time was created along with the space when the universe began. No one knows this moment as there was none and no instruments to record this. In cosmology, a sudden explosion known as inflation followed by a Big Bang was supposed to be the beginning of the universe. After many billion years, world appeared, containing beings with intelligence. Few more millions were needed to develop countries, nations and religions. The tick tick of the clock kicking back of which we have only an immediate sense that something is passing is our notion of time. The clock and watches are the time-keeping record for short intervals of time such as hours, minutes and seconds. The calendar is, however, a time-keeping record for long interval of times such as years, months and days. Humans have felt the need for long time-keeping records for many political, religious and civic purposes. This need gave birth to a number of different calendars such as Chinese, Mayans, Hindus, Jewish, Julian, Gregorian and Islamic calendars to name few which follow either solar or lunar cycles. Many lunar calendars existed throughout history consisting of 12, 13 or more months. Similarly the days in a lunar month were not fixed. It would vary from 29 to 35 or more days as decided by the Arab community that used those calendars. about 12 times faster than the Sun , completing its rotation round the Earth relative to the fixed stars in , about 27 ½ days. This is called the Sidereal Period. The Synodic Period or Lunation, on the other hand, is the time taken by the Moon to move from one position to the same relative position with respect to the Earth and the Sun. It is roughly 29| days. The sidereal period is the one which is more important than the synodic period or lunation in astronomical calculations. The lunation is more useful for observing phases of the Moon and is used in lunar calendar compilations. Figure 1: When the Moon is at M5, it becomes invisible and called New Moon. The Hijri calendar is purely a lunar calendar which depends on the motion of the Moon round the Earth which in turn moves round the Sun. These motions are of two types. One is associated with the diurnal motion due to the spinning of the Earth round its axis. This is responsible for daily apparent rotations of the Moon, the Sun and the fixed stars round the Earth. The other motion is associated with the rotation of the Earth round the Sun taking the Moon along with it. These motions give rise to what is known as the apparent motions of the Sun and the Moon round the year against the background of fixed stars in the sky or celestial sphere. The plains of these orbits are inclined to each other by 5°9' roughly. The Earth and the Moon come in between the other two in course of a month. 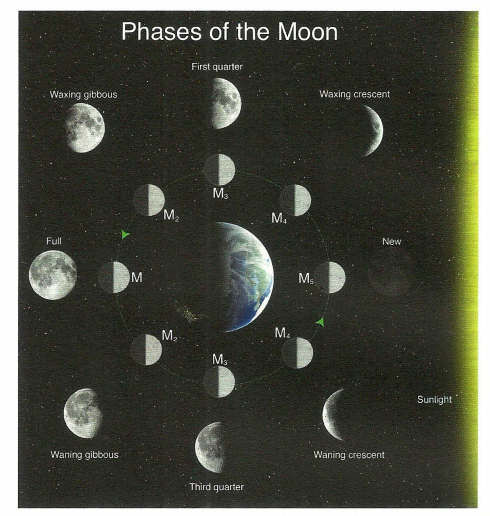 The motion of the Moon round the Earth, the Sun being fixed, gives us the different phases of the Moon round the lunar or Hijri month as shown in Figure 1. If the centre of the Moon lies in between the Earth and the Sun in the same plain containing the centers of the Sun and the Earth and the Moon, the phenomenon is called conjunction. The Moon in these positions is called New Moon. The day is called conjunction day. Depending on the distance of the Moon from the Earth, the Sun gets hidden partially, we may get a partial solar eclipse. But if the centers lie in the same line, we get a total or a ring like annular solar eclipse depending on the distance of the Moon from the Earth. The dark part of the Moon in this condition is towards the Earth. There is no crescent at the time of conjunction or New Moon. Some high peaks of the lunar mountains may reflect the sunlight towards the Earth but being in the glare of the Sun they cannot be seen by the eyes or photographed by the telescope. The glare of the Sun comprises hot gases surrounding the sphere of the Sun known as the Corona. Its temperature is around 20 million degrees centigrade while the average temperature of the surface of the Sun 's sphere is only 6,000 degrees centigrade. The corona can be seen at a place of total solar eclipse. As the Moon moves along its orbit more of its parts are lighted. When the angle between the Sun, the Earth and the Moon, known as angle of elongation, is about two degrees, the first crescent is formed. It cannot be seen as it is still in the corona. When the angle of elongation is 8 to 10 degrees (16 to 18 hours after conjunction time), the crescent comes out of the corona and can be seen and photographed. This will happen next day to conjunction. The phases of the Moon are due to conjunction which are shown in Fig.l. If we are on the Moon we will find that the Earth passes thru different phases like the Moon but in the reverse order. The conjunction marks the end of the lunar month in Astronomy which is roughly 29 ½ days. The next day marks the first day of the next lunar month in Astronomy. The visibility of the first crescent, however, depends on uncontrollable factors which cannot be evaluated mathematically or observationally. Weather permitting, it is generally seen next day to the conjunction. If the crescentis not visible on the 29th due to weather conditions etc. it will be visible next daymaking the observable lunar month of 30 days. The conjunction is calculated by employing Universal Time (UT) and the Julian Day Number (JDN) which is the absolute count of days and the fractions thereof that have elapsed since Monday Noon, 1 January 4713 BC on the Julian calendar, at zero longitude which passes thru England, France, Algeria and many other countries. All calendars such as Julian, Gregorian, Hijri and many others owe their origin from this JDN calendar by converting their data from Julian Day Number and universaltime. Noting down every single detail of a 2000 year comparative calendar on printed matter is not an easy task. Tabulating day-by-day records on paper would require printing several volumes to cover the whole 2000 year data set. To tackle this issue, the tables in this book are formed to contain essential comparative dates, namely the last day of a Hijri month and its corresponding date in Julian/Gregorian calendar. Furthermore, since conjunction always happen on the last day of the Hijri month, the time of conjunction is also shown in each row entry of a table. Hence, listing the last day of each month in the tables seemed to be the ideal entries for this comparative calendar. With this scheme, data of six consecutive years could be fitted per page. One drawback of this formatting scheme would be that if the table of a single year is viewed individually, then this table will not contain the first day of that particular year. But when viewing tables of two consecutive years, one can follow the flow of dates from the first table to the next and compute the date of the first day of the subsequent year. Similarly, to find out the corresponding date for 1/1/1H, the reader may first locate the date of the last day of Muharram, i.e. Thursday Muharram 29, which corresponds to August 12, 622AD and compute backwards until the first of Muharram is reached. The first of Muharram 1H corresponds to Thursday July 15, 622AD. In fact, this exercise is demonstrated for the month of Muharram of 1H in the first table. It is worth mentioning that the Hijri date of the day before 1/1/1H,ie. Wednesday July 14, 622AD is Zul-Hijjah 30, and the conjunction on that day occurred at 05:00 am UT. · . Centennial years, such as 1700, 1800, and 1900 cease to be leap years, but years that can be divided by 400, such as 1600 and 2000 continue to be leap years, October 4 , 1582, was to be followed by October 15, 1582. The Gregorian calendar switch that occurred in 1582, where October 4 is followed by October 15, is also considered in this comparative calendar. This change is apparent in the table of the year 990H, where the calendar type in the header shows "Julian/Gregorian". The last day of Shabaan in this year corresponds to Sunday September 16 and the last day of Ramadan of the same year corresponds to Tuesday October 26. This is due to the 10 day shift introduced by the Gregorian calendar switch. Dr. Fadhl Noor Mohammed Ahmed is an eminent Saudi Astronomer and the former Chairman of Department of Astronomy at the King Saud University in Riyadh and the Ex. Director General , Institute of Astronomical Re-searches, King Abdulaziz City for Science and Technology (KACST), Riyadh. His father came from Bhopal state to settle down in Nagpur, now Maharashtra state in India. He was born at Nagpur in 1927. Since his childhood, he was obsessed with heavenly bodies. 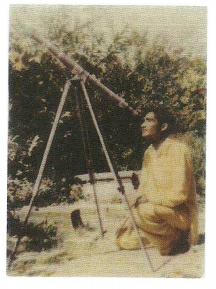 At the age of 14 he constructed his first hand-made telescope. He has been known as "Chand Wala Babu" (Moon Gazer) among the local residents. He finished his high school from Anjuman High School, Nagpur in 1946. He pursued his Bachelor's degree in Science in Applied Mathematics, Pure Mathematics, Physics and Astronomy from the Institute of Science, Nagpur University. Upon finishing his bachelors degree in 1950 he moved toLahore - Pakistan and obtained his M.Sc. degree in Physics in 1952 from Panjab University, Lahore, Pakistan. To pursue his childhood dream of studying Astronomy he moved from college to college as a Lecturer in Physics and went to Baghdad as an Associate Professor in the Iraqi Ministry of Education in 1957. He then proceeded to the UK in 1958 for his higher studies and obtained the Ph.D. degree in Astronomy from the University of Edinburgh - UK. For post doctorate work he proceeded to Boston University -USA in 1964. He moved in 1968 to King Saud University, Riyadh, Saudi Arabia to supervise the Kingdom’s large scale observatory project. At King Saud University he earned another "firsts" to his achievement list when the Governor of Riyadh, now Minister of Defense, Prince Salman bin Abdulaziz, inaugurated the first Astronomical Observatory of the Kingdom, constructed under his supervision after establishing the Astronomy department in King Saud University. The large scale observatory project was transferred from King Saud University to King Abdulaziz City for Science and Technology (KACST) and he was moved to King Abdulaziz City for Science and Technology (KACST), Riyadh, as the Director General, Institute of Astronomical Researches, where he carried out a large number of other technical projects setting up a Laser-Ranging Observatory and several Moon 'Hilal' Sighting Observatories to mention a few. 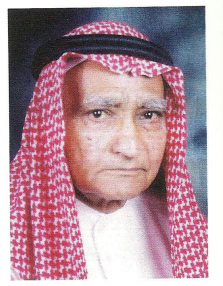 Dr. Fadhl Ahmed retired in 1990 but has kept himself active always. His most recent scientific publications published in 1999, 2004, 2005 were in particle physics and cosmology. He has devoted his retired life to transfer his knowledge and educating the young generation by writing scientific articles in the reputed Urdu Magazine “Science Monthly”, New Delhi, India.